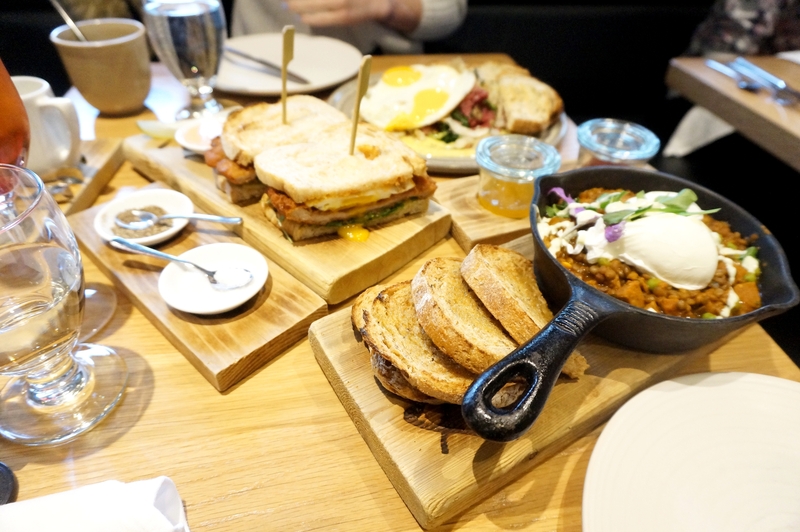 I was after a good brunch in BC one weekend and I happened upon an article describing he brunch on offer at forage. I enlisted a friend to help me order as much as possible on the menu and after careful deliberation we settled on the following: The double fried pork chop sandwich, the corned bison hash and the spiced lentils. Moving out of the comfort zone we were playing it dangerous with the bison hash which was paired with kale, house-made sauerkraut along with an IPA mustard hollandaise as well as the spiced lentils which was served in skillet with merguez sausage, poached eggs, spring peas, pea tips, mint yogurt and toast. They all came out together and looked amazing. The first thing I noticed was that the eggs were cooked perfectly on every dish. I started with the pork chop sandwich, done very classically; almost too much so, the sandwich lacked any defining flavours and could have done with more moisture, and the bread along with the double fried chop were quite dry. This was definitely my least favourite dish. I went with the hash next and was not disappointed, the flavours all complimenting each other and each ingredient accenting different textures. 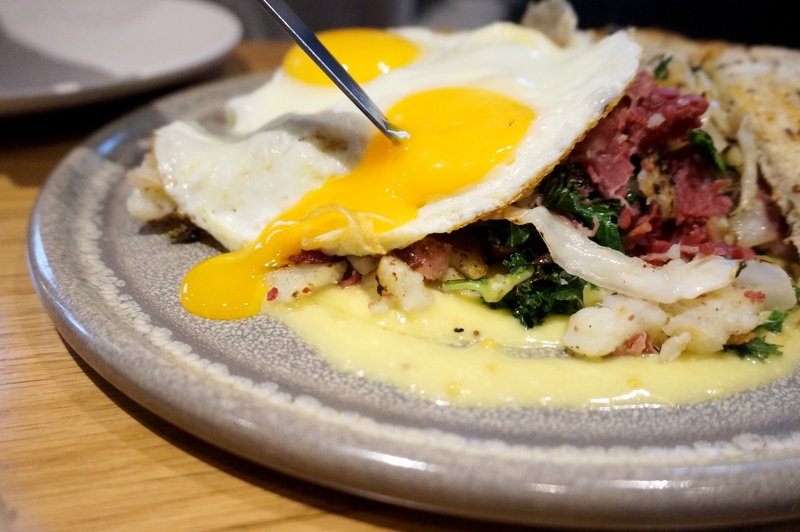 The egg yolk spilled into the hash and added an extra creamy depth to it. This dish was not as heavy as I was expecting it to be; the potatoes and hash were light and lean and while full of flavour not leaving you feeling heavy and unhealthy. Lastly the lentils; I was most skeptical about this dish; I wasn’t sure how well they would put everything together but boy was I wrong. 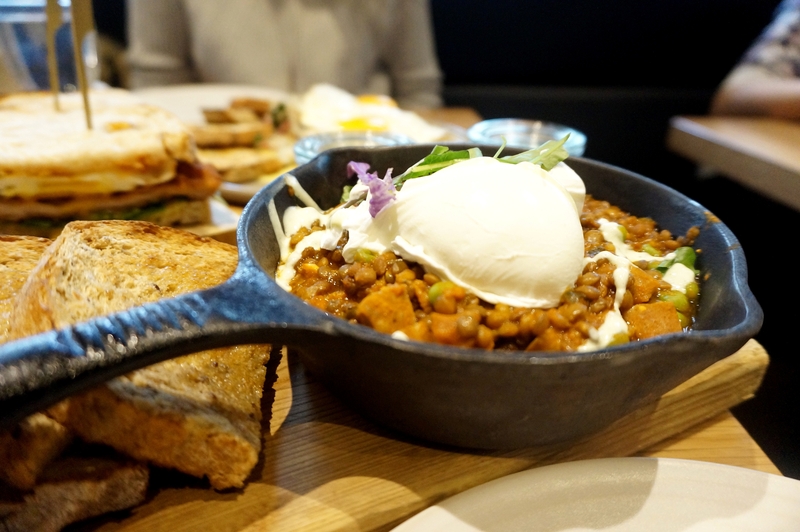 The dish was superb, the flavours, creamy textures of the lentils, sausage and the perfectly poached eggs worked wonders with their sourdough toast. If I’m ever in Vancouver and looking for a great brunch I will definitely making another trip to forage. 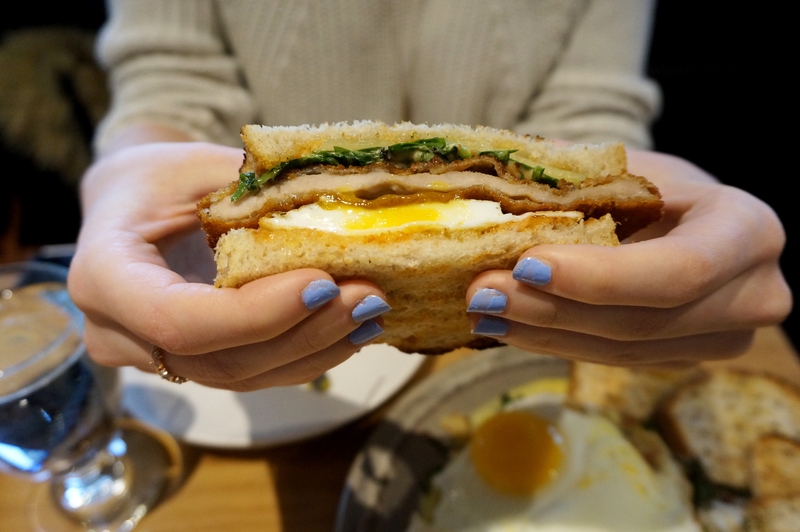 Posted on May 27, 2016 by AdrielPosted in Brunch n Lunch, Canada, VancouverTagged Brunch, Pork, sandwich, vancouver.